Mo dupe f'ori b'ale to Olodumare for creating the conditions which make the study of medicine possible. Mo dupe to the Eleye and Nana Buruku for creating the base of feminine power to balance the masculine energies which empower Ifa. Mo dupe to my Ancestors for the opportunity to live and study medicine. Mo dupe to the Orisha matrixes. Mo dupe to the Teachers of medicine for being so kind as to reveal the methods to study medicine. Mo dupe to my godfather, Awo Adebolu Fatunmise and my Ajubona, Oluwo Baba Fabukola, and to all the holders of this tradition for making the connection for me so that I may continue to study. May all beings benefit from the medicines which come from the earth, though the blessings of asé, and by the grace of Olodumare through Osanyin. Note: tonal accents and other pronunciation guides for Yoruba words cannot be created in the font system which this web page uses. Please consult a Yoruba dictionary for these. I recommend Fama's Ede Awo: Orisha Yoruba Dictionary by Chief Fama. The medicines of Africa are vast in scope, so a comprehensive survey would be much too ambitious a project for this section, even if it were permissible to discuss all subjects freely. Just as in Tibetan medicine, there are aspects of the spiritual tradition of Ifa medicine that may not be communicated to the uninitiated. Nevertheless, as with other traditional medicines, both physicians and patients can learn to understand some of the perspectives that these systems bring to our world view. The complex herbalism of the West African religious system of Ifa is the subject of this page. Our connection with it originates with the Yoruba people, who have integrated aspects of Greek, Egyptian, and Arabic traditions. Ifa medicine is a complex and, in the West, largely unexplored subject. The slave trade transported many Yoruba into the New World, resulting in strong influences of Ifa in most of the New World systems of Vodou, Candomble, Lucumi, Shango,and Santeria. However,the medical systems of these religions are far beyond the scope of this discussion. As with most orthodox systems of religion, practitioners of Ifa embed themselves in a complex system of tribal and cultural obligations, which determine not only the view point of the practitioner regarding external phenomenon, but also immutably affirms the connection between human beings and the world around them. In parallel with Taoism, education in Ifa creates an appreciation that the individual cannot be removed from the matrix of relationships which extend beyond those of humanity and the animal realm. Within this tribal system, the web of influences of natural cycles of the day, season, and phase of life surround the patient. Subtle influences from the plant world and realms of sentient beings, which find their abode in the wind, the earth, the sky, and other places, are accepted realities to the Ifa herbalist and physician. Disease is primarily understood as a disorder or misalignment of the internal or external milieu of the patient. Part of the role of the physician is to align the patient with the matrix of influences that will rebalance their particular disorder. Sometimes also, a disorder develops as a result of losing or ignoring a relationship with a matrix of influence. Utilizing non familiar forms of diagnosis, such as divination and dream interpretation, in addition to the traditional format of questioning, observation and touching, the Ifa physician may use familiar techniques of dietary therapy, psychotherapy, surgery, and herbal medicine, but may also perform exorcisms, rituals, sacrifices and other procedures which seem more the province of priests than physicians. In fact, Ifa physicians are often priests, priestesses, or high priests, or belong to a guild-like society hidden within tribal boundaries, completely secret to the outside world. In Ifa communities, even obtaining an education in medicine may require becoming an initiate of one of these societies. The high priests interpret the factors surrounding a patients misalignment by means of their connection to the various oracles of the religion. These reveal themselves through divinatory activity of the priests and an elaborate corpus of oral tradition that interprets the divinatory symbols. 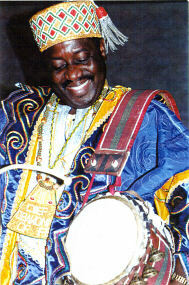 The world view of the Ifa priest involves training and discipline to interpret events that are indicative of the nature of the patient's alignment internally with their own conscious and unrecognized issues, as well as with a variety of external forces and beings which inhabit our realm and require the inner vision and wisdom of the priest to interpret. Central to the tenets of Ifa is the necessity for practitioners to establish a good relationship with the world that we inhabit. Ifa practitioners have faith in a form of reincarnation where the individual repeatedly returns, after death, to greet the earth, while part of that individuals essence always resides in heaven as a spiritual double. The Ifa concept of fair exchange means also that by greeting the earth with good character, the natural world will welcome us and support us. We will live in harmony with the seasons, environment, and the other inhabitants of the earth. Clearly understood also, is that if we disrespect our environment, abuse and squander the gifts and blessings that we enjoy while on earth, suffering will be the outcome. Living in an honorable path requires that the practitioner develop specific attributes of good character and moral behavior. This entails personal responsibility, a gentle nature, and a humble disposition. The primary characteristic of adult behavior is the willingness to take responsibility for oneself and one's actions of body, speech and mind. Children and the immature lack this quality and the level of immaturity of an individual can be judged by their attempts to escape responsibility and to shift blame to others for their own decisions and actions. The mature practitioners of Ifa have learned that spiritual progress is impossible without a willingness to take responsibility for their own selves. It is axiomatic also that one can only take responsibility for oneself, and any attempts to control or try to take responsibility for another's actions is inherently misguided. Gentleness is consistent with an attitude of non harmfulness and a tendency to speak and act mildly. In a way, it is another manifestation of personal responsibility and personal discipline. A gentle nature also entails a correct and proportionate response to situations. Ifa tradition speaks of the value of having a cool head, and not acting in anger. But, as in Tibetan tantrism, a gentle nature is not incompatible with fierceness in certain appropriate circumstances. The practitioners of Ifa were not primarily warriors, but they understood the warrior mind set and the value of focused determination to overcome conflict. This type of disciplined conditioning of the mind is also found in Tibetan and Japanese martial arts and their associated spiritual milieus. Indeed, there are warrior aspects to the spiritual path of Ifa as there are with other traditional spiritual paths. Development of humility in Ifa is a natural result of a realistic recognition of the place of human beings in the creation. If we have blessings and benefits in our lives, it is often due to the kindness of others in this life, and the actions of our ancestors in the past. None of us exists in isolation or independence. We need others to grow and transport our food, build the houses, roads and infrastructures that supply us with clothing, utilities, and other necessities. Our teachers guide and provide us with the accumulated experience and knowledge of the ages, enabling us to grow intellectually and spiritually and earn a livelihood. The skills and efforts of others benefit us every moment we are alive, and in fact, few of us would survive if it were not for a web of strangers who we often don't ever meet, and rarely acknowledge. One indication of degradation in society is the general inhospitality and rudeness evident at almost every interaction. Pride and arrogance in personal behavior has become the norm. Citizens view and treat each other with suspicion and disrespect; even though the next stranger they meet might be a benefactor who built the house they live in, or grew the food that they ate for breakfast. Simple recognition of the undeniable reality of our interdependence leads to a more respectful and friendly general attitude. Another powerful indication of degradation is the lack of courtesy and honor within members of the same tribal affiliation or even within the same family. It is commonplace in modern life to see children disrespecting their parents and teachers and husbands and wives treating each other in contemptible fashion. Physical and emotional abuse and violence between family members has become unremarkable, and denial of personal responsibility widespread on every level of behavior. One of the powerful central concepts of Ifa is the balance of give and take. This requires an equitable exchange in any interaction for it to be successful. If an Ifa practitioner asks for something, they will expect that some offering will also be made. This viewpoint leads to the realization that the most valuable assets are those which we will give away. So, if a person wants respect, they must first learn to give it. If a person wants wealth, or love, or any material or spiritual benefit, it only will come following genuine efforts to offer the very same benefit in kind. In contrast, an attitude of entitlement, arrogance, and superiority leads only to spiritual poverty, and ultimately, the blessings of the earth and tribal support are withdrawn. The therapy for this illness of the soul in Ifa is the aforementioned recognition of our true position on the earth and bringing our actions into respectful balance with the natural world. The Tibetan practice of lam-rim leads the student to realization of our interdependence with members of humanity and the animal realm, as well as with other realms of sentient beings, through meditational exercise. Most Oriental disciplines and Ifa also require the aspirant to acknowledge their obligations to their ancestors through respectful meditation and ritual. Aside from cultural expectations of moral behavior, ifa person works diligently to understand and appreciate the contribution of their ancestors to their present situation, and seeks to think, speak, and behave in a fashion that would bring respect and honor to the memory of those ancestors, the natural result is a development of a humble nature. The traditional Ifa physician and herbalist must develop the capability to work within, and understand the nature of, the invisible realm. That is, it is invisible, but not unknowable, to the initiated practitioner. The invisible realm is not invisible because it is occult. It is invisible because it is unlooked for. The invisible realm is not a place of unreality or another reality; it is a subtle aspect of our everyday-every moment reality, accessible to disciplined investigation, like all scientific pursuits. Until initiated, practitioners have no recognition of the issues that will become central to them for the rest of their lives. Although seemingly an unusual ability, many examples from everyday life present themselves. As an example, any of us can look at a gemstone and admire its beauty and rarity. A trained jeweler may study the same stone and note certain characteristics that have been pointed out to him by his masters as having importance. So, through the teacher sensitizing the student to become aware of factors formerly ignored, a realm that was formerly invisible but always present, becomes accessible. The jeweler becomes aware of a more subtle level of evaluation. Flaws, proportions, and other issues beneath the notice of the untrained senses are noted and their effect on the identification and value of the stone appraised. If the jeweler is a cutter, then another layer of subtlety exists in the appraisal as to how and whether a recutting will improve the characteristics of the stone. At any level beyond apprentice, the same analogy applies in many fields, from bricklayers to movie directors. Calligraphers note tiny imperfections that others cannot see, musicians note qualities of melody and rhythm that may be unnoticed to the average ear. The medical student who learns to identify the qualities of the pulse, the palpation of points on the body and the signs and symptoms of disorder in a patient, very soon develops skill at seeing problems before they appear to untrained eyes. After some decades of practice, this ability can reach levels of understanding not only of the superficial and hidden nature of the imbalance, but also how to apply the most effective complex regimens required to restore the patient toward health. The realms of sentient beings accepted by Ifa includes a group of primary importance to understanding the interactions between our everyday view and the invisible realm. These powerful beings exist in dimensions both here and beyond our earthly realm and are known as irunmole. Ifa tradition suggests that they came to the Earth from heaven and a subgroup of these beings have historically established connections with human beings in the homeland of Ifa, and are now known as "orisha". Some writers have used the word "angel" as a term for the irunmole, suggesting they are intermediary between human beings and the Creator and may, in some situations, act as messengers between the spirit realm, heaven or ikole orun, and the earthly marketplace, or ikole aye. Several of the orisha have become known to the priests of Ifa, and are recognized as having particular realms of abode and territories of influence on earth and beyond. These characteristics create a matrix of interaction that can, under certain circumstances, involve an individual practitioner or priest/priestess of Ifa. For example, the Orisha Osun, is thought to inhabit the fresh water and lagoon and river environments, has a particular connection with feminine protection, creativity, and fertility, among other characteristics. Note that Ifa is not animistic, ascribing sentience to a lake, for example, but rather have the belief that Orishas tend to inhabit certain natural areas of the world, such as lakes, rivers, the oceans, the earth, or the wind. Generally, although it is imprecise and misleading to anthropomorphize the Orisha, symbolic characteristics understandable to human beings are sometimes ascribed to the Orisha. Stories and folktales of the exploits of the Orisha in ancient times are part of the oral tradition of Ifa and present the Orisha as possessing human characteristics, much like the ancient Greek gods. Alternatively, orisha may be seen as potentials within human beings which, when actualized, allow a person to interact with the universe on a different level. A person in touch with the power of Shango, for example, may have particular ability as a strategist, or drummer, or magician. 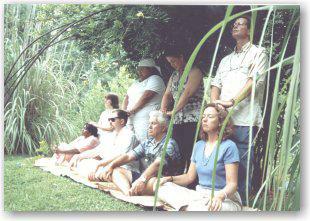 With a change in tone, the word Ori in Yoruba also applies to the spiritual path or destiny of human beings. It can also refer to the head of the practitioner, which has a subtle connection, as noted before, with a spiritual double in heaven.